A single guidebook to walking the whole Wales Coast Path - 1400km (870 miles) the length of Wales from Chester to Chepstow, including Anglesey, described in 57 stages. 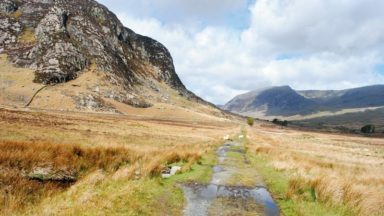 The route passes through the Snowdonia and Pembrokeshire National Parks and many AONBs and can be linked with the Offa's Dyke Path for a complete circuit of Wales. This guidebook explores the Welsh Coast Path which, at 1408km, is the longest trail in Britain, as it traces the coastline from Chester to Chepstow. This guide divides the Path into 9 geographical areas and 57 stages, ranging between 15 to 32km in length. 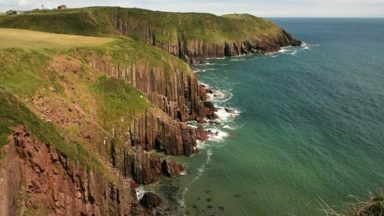 The names of Anglesey, the Llyn Peninsula, Cardigan Bay, Pembrokeshire, and the Gower conjour ideas of spectacular scenery, world-famous geology, seabirds and wildlife, all of which can be explored with this guide. Alongside detailed route descriptions and maps for each stage, the guidebook provides a range of practical information, whether you plan to walk the Path in full, or as a series of day-walks. 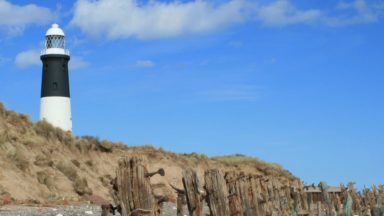 Travel information, advice on accommodation and planning, as well as details on the history, wildlife and geology of the coast ensure that this is an ideal companion to uncovering the Welsh coast on foot. Stage 15 - The route has changed at Pont Britannia. Instead of heading inland, go under the bridge and continue along a well-wooded coastal route. Later, use a field path, tracks and roads to reach a roundabout at Parc Menai. Continue with the route description to Y Felinheli. The Halfway House has closed, but a cafe and restaurant are available. 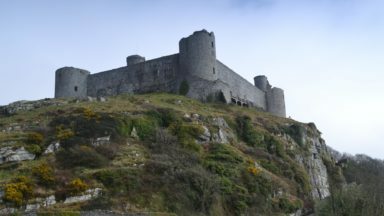 Stage 44 - Llansteffan to Ferryside - 28km (17½ miles) - This entire stage heads inland to Carmarthen in search of a bridge over the Afon Tywi, finishing back at the river mouth barely 1km (½ mile) from where it started. However, there is now a ferry service between the two villages, allowing walkers to stay on the coast and save themselves a whole day of walking. Check www.carmarthenbayferries.co.uk for timetables. Stage 1 - The route is described as crossing a road bridge between Garden City and Queensferry. Don't cross this bridge, but continue straight onwards as signposted. The route now crosses a pedestrian footbridge attached to a railway at Hawarden Bridge. Continue as described to Connah's Quay. Stage 2 - After leaving the marooned ship, the Duke of Lancaster, the route is described as following the coast, then heading inland to a main road near Mostyn. On the way inland, a new path has been opened through a birch wood. This is clearly marked, and although it soon leads back to the main road, it avoids part of it. The Lletty Hotel, currently closed, is no longer on the route. Stage 2 - After leaving Ffynnongroyw, the route runs towards a gas terminal. After passing under a rail bridge, turn right as signposted along a new tarmac path, which runs closer to the coast than the original route. The original route is joined later and continues along an embankment to Talacre. In case of a high tide at Talacre, the onward beach walk can be avoided by following a clearly signposted route a little further inland, passing through the Presthaven Sands mobile home park to rejoin the main route. Stage 17 - The 'snacks cabin' at Porth Towyn now has a larger café and gift shop built beside it. Stages 17 to 20 - Transport - The Llŷn Coastal Bus operates from Thursday to Monday, from April to October, linking Nefyn, Morfa Nefyn, Tudweiiog, Porth Oer, Aberdaron, Rhiw, Pentowyn, Abersoch and Llanbedrog. Timetables are available at www.bwsarfordirllyn.co.uk. Using the bus can avoid having to extend or contract daily stages in places where accommodation is sparse, by allowing walkers to commute to and from places on the Coast Path. Stage 23 - The Wayside, which used to offer food and drink on the road to Llanaber and Barmouth, closed and has been replaced by the much larger Norbar. If you're considering walking the Wales Coastal Path, I would make this your Bible. 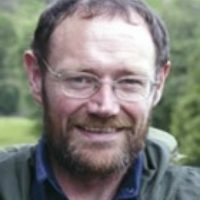 Paddy Dillon is a well-established long-distance walker who has walked all of Britain's National trails and many more in other countries. He has written more than 60 other guide books and uses a tablet to write his route descriptions as he is walking along so they are very precise. Having got lost during my journey when the path heads inland, Paddy's precise directions would have been very handy at the time. The book starts off with a brief introduction to Wales and its geology. history and wildlife. Not too much to bog you down but enough so you get a feel for the rich history and know what to look out for on your journey around the coast. 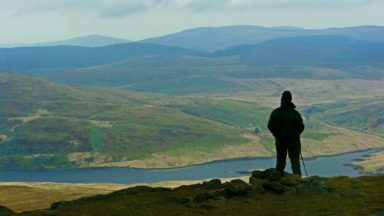 There are regular website references throughout the book in relation to camping facilities, youth hostels and other useful information to make planning your walks easier. The guide is very accurate step by step description. The walks are approximately 15 miles in length. Each stage is introduced with a start and finish point, the length of walk for that stage, and a profile of ascent. Along with a brief description of what terrain to expect on the walk and some photos and a map of the walk. Cicerone has a website where you can download a gpx file of each section. There is a reference to refreshments which mentions pubs and cafes you can stop at and transport links and accommodation. At the back of the book is an appendix of each stage showing the distance and whether along the route you will find accommodation, cash points and refreshments. Also, handy for the non-Welsh speakers is a brief translation of common Welsh words. The book really is a complete guide in every respect, and I would go so far as to say if you're considering walking the Wales Coastal Path, I would make this your Bible. "The Wales Coast Path, which opened in 2012, is the longest waymarked trail in Britain running 875 miles from Chester to Chepstow. This guide describes a 57·day schedule for the route. with days covering distances from 12 to 20 miles, although it will still be useful if you don't stick to this schedule exactly. 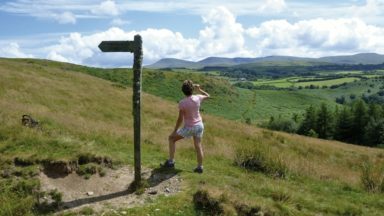 The days are also grouped into nine sections, each one between four and 11 days long - useful if you're planning to do the walk in stages rather than all in one go (and reaching the end of each section will be a mental milestone if you're doing the whole walk). Packed with information, including a whopping appendix that shows the amenities in every town and village along the way, while still being quite compact." The photography is up to Paddy's usual high standard, giving a mouth-watering incentive to would-be walkers who want to literally 'discover the shape of a nation'". "9 of 10 unspeakable place names"
Read the full review here (may need to translate it).